Every year, following Easter, there are a number of rabbits turned in to shelters and rescue groups across the country. When you consider which local animal care groups to support, don’t forget the small mammal rescue groups who often take these companion animals from shelters built to house dogs and cats. Rabbits make excellent companions, but they are so different from dogs and cats that many people find they are not a good match after impulsively bringing one home. A good pet shop will take the bunny back when there is a mismatch, but some rabbits are given as gifts and the recipient isn’t always sure how to successfully return the gift. In our local shelter there are currently 10 rabbits. One Easter give was relinquished after 2 weeks and another after only 2 days! As prey animals, rabbits are shy with strangers and need time to trust and settle in. 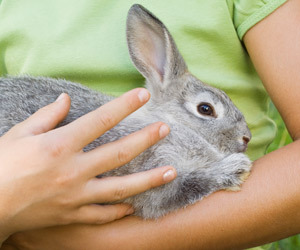 If you’ve considered adding a rabbit to your family, check out houserabbit.org and busybunny.com for information on caring for these special animals. If you have not considered them before, look for the “herding rabbit” on YouTube. You’ll be surprised at the intelligence and versatility of rabbits as pets. If you are ready to take the plunge, type in your zip code here to find a rescue near you that houses rabbits or can refer you to a group that does. And remember, rabbits live ten years or more so perhaps you will be celebrating Easter 2023 with your newfound friend.